Racing Background: 21 years of truck and tractor pulling. Dan has been racing Monster Trucks since 1988. Truck Facts: 1998 Chevrolet Silverado / 3-D Design by GTS Fiberglass. 572ci Keith Black Hemi. Four speed Lenco transmission with air shifter. 2 Nitrogen charged gas shocks per wheel. SCS gear box, Rockwell axles. Chassis was custom built by Dan Patrick. Valued at $ 175,000.00, the truck took just over 6 months to build, and weighs in at 10,350 pounds. Sponsors: Jet Hot Coatings, Martin Labs, Justice Brothers, Crower Cams and Equipment, Optima Batteries, Tool Buddy, Microsoft Corporation, Race Rock International, Inc., BOC Gases, Valco Cincinnati, Childs and Albert, Champion Spark Plugs, FK Bearings, Inc. In February 1984 Dan participated in the first motorsport event in Madison Square Garden, NY. In 1986 a cartoon series was produced by the Playskool Toy Company featuring Dan's "Warlord" pulling Funny Car. Dan was the first racer to ever make a sub 5 second run on a competition legal track. In 1994, Dan ran 4.983 seconds in Bloomsburg, Pennsylvania. Voted 1994 Sportsman of the Year and Monster Truck of the Year by the MTRA (Monster Truck Racing Association). In February 1996 Samson was elected to represent Monster Truck Racing at the Grand Opening of the first motorsports theme resturaunt, Race Rock Cafe , in Orlando, Florida. One of Dan's trucks is on permanent display inside the resturaunt. Dan won the 1996 Sportsmanship of the Year award, and the first ever "Crash of the Year" award by the MTRA, resulting from his infamous rollover in Bloomsburg, Pennsylvania earlier that year. (See pics below). In January 1997 Dan participated in the first Prime Time Live Television coverage of a Monster Truck Motorsport event, "Motor Madness", airing on TNN (The Nashville Network). 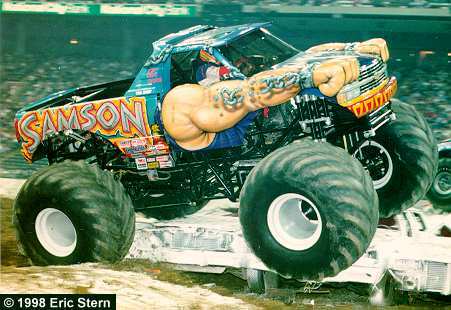 In June of 1997 Dan was awarded a Patent from the United Stated Patent and Trademark Office in Washington D.C., for the 3-D Body Design of the Samson Monster Truck. Samson finished 3rd on the 1997 Special Events Points Series - his highest finish ever in that series. Warning the pictures below are very high quality, please be patient while they load.